Our latest case study features the Nevada Department of Motor Vehicles and dealerships across Nevada. Ted Imfeld of the Management Services & Programs Division at the NDMV said he began researching a waterproof solution for the state’s temporary vehicle license plates in 2014. They needed a durable synthetic paper that could be easily printed on, but would also stand up to Nevada’s snowy winters and swirling summer sands. Additionally, dealerships across Nevada had to be able to place orders for this temporary DMV license plate on an as-needed basis. Relyco has always prided itself on our company’s dedication to customer service, so it was wonderful to hear from Imfeld that our service set us apart from the competition. Ultimately, we created a special purchasing program for Nevada dealers to place their orders for the temporary DMV license plate. Now all temporary plates in Nevada are printed on Relyco’s waterproof, tear-proof REVLAR synthetic paper. We have shipped out 400 million plates to Nevada dealers thus far! 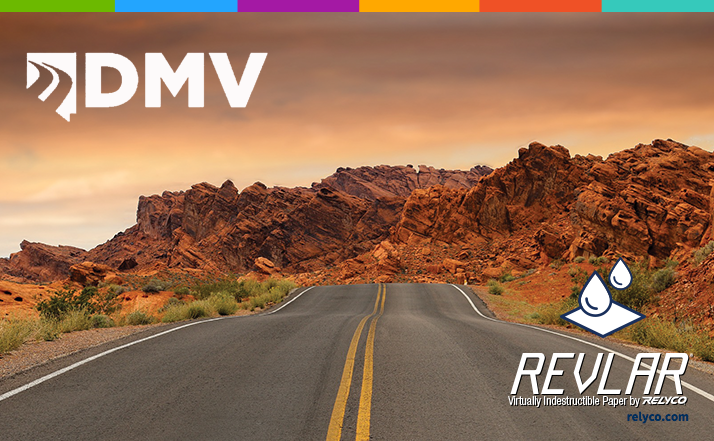 Click here to read more about how Relyco makes registering vehicles easier—and better—for the state’s DMV and dealerships across Nevada. If you’re interested in checking out our temporary license plates, click here or below. We’d love to chat with you about your options with various templates, materials and coatings. We will even send you some free samples if you like.